Figure 1. Proven track record. 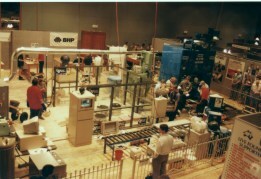 World Conference Systems has been organising events for thirty years, from as few participants as fifteen to as many as 960. World Conference Systems have the capability to meet these needs, with thirty years experience organising conferences, seminars, workshops and corporate events. We manage events with as few participants as fifteen to a high of 960 people, with the aim of producing and delivering a quality event for the attendees, with a financially successful outcome for the customer. We have the resources and capability to meet your requirements for any event/conference. Why hire a professional conference manager? For the same reason you hire any professional service - because we are the experts in our field. We can establish a critical path that will be the working model for all conference planning and execution. This keeps you on track with specific tasks and deadlines, identifies responsibilities, and allows for best use of resources. We have experience in developing and administering conference budgets that cover all key operational areas. We can also keep track of budgets relating to sub-committees and third parties. The first contact most participants have is with the conference brochure. 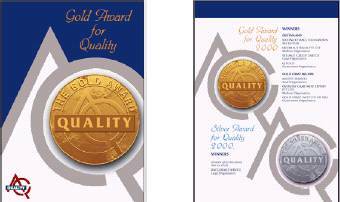 World Conference Systems has specialised experience writing and designing conference brochures and are the publishers of Coatings and Fabrication magazine and former publishers of The Business Improvement Journal for the Australian Organisation for Quality. Figure 2. Professional Brochures and Printed Materials . A good conference organiser will have access to expertise in these areas. We can provide direction and assistance to help you meet and exceed your goals through sponsorship. We coordinate a comprehensive registration system, create databases, process registration payments and generally assist with participants' requirements. 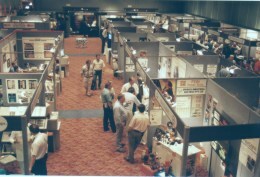 Exhibitions strengthen ties between businesses, associations and individuals. We are available to take care of all levels of exhibit organisation, including accounting and essential liaison between exhibitors, the event and the exhibition venue. Figure 3. Professional exhibition management. The exhibition adds to your event and becomes an important revenue stream if handled correctly. 80 th Birthday Celebratory Dinner for The Rotary Club of Brisbane. Mario Pennisi, General Manager, World Conference Systems. Mario has had a distinguished career in the field of metallurgy, working in the commercial sector before becoming the Manager of the Department of Mining and Metallurgical Engineering at The University of Queensland. He presented at conferences worldwide and published fourteen books. Mario holds qualifications in Quality Management and is a Senior Member of the American Society for Quality, a Committee Member of Standards Australia, a member of AOQ, and is named in Who's Who. A final registration form and nametag will be provided to each delegate and partner when they register on arrival to the conference. Figure 5. Professional Conference Management System. Our system performs administrative tasks quickly, accurately and efficiently. We feel sure that our joint experience and efforts will make your event/conference an outstanding success. Allow us to provide you with a quotation for your next event. You will find us very competitive. We provide personalised services by the people who own the business!